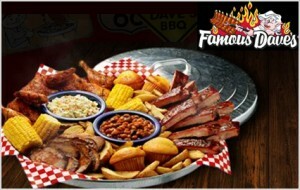 Famous Dave’s: FREE Meal on Your Birthday! Are you a barbecue lover? Join the P.I.G. (Pretty Important Guest) Club at Famous Dave’s and you’ll receive a voucher for a FREE meal on your birthday! You’ll also receive news and special offers via email. Valid only at participating locations. Happy Birthday! Over the summer, I’ll be posting more birthday offers, so be sure to refer back to the full list for any that you may have missed. I have been a PIG member for several years, while I have gotten a coupon each year I have never gotten a meal. Each coupon has a code that tells them what to give you its often just a dessert or appetizer. Not a meat but still good. We’ve been a P.I.G member for years. They will send you a coupon to print for your birthday and it is something free. However, most of the time it is for a free dessert. I guess they can send you one for a full meal or appetizer but we’ve never got one. I need a free Birthday Dinner for Famous Daves for my birthday Tommorow. How do I get one??? Famous Daves restaurant has been able to own nearly 500-awards for providing quality food as well as customer service, which is one of the main reasons why it is hard to find the free coupons of this restaurant. My husband received a coupon for a Famous Dave entree (Buy One, Get One Free). We went to Famous Dave’s tonight to celebrate my husband’s birthday, and found out that he only receives $10 off our bill. How can that be? If the coupon is BOGO, how is it that we only get $10 off our bill? That is misleading, and we are NOT HAPPY CUSTOMERS!!!!!! I really enjoy your Barbeque deals, you guy’s really got soul. Keep up the good cooking. My birthday is March 19th birthday certificate thank you. Today is my birthday and just realized I did not rec’d my e-mail coupon for my birthday today. Really disappointed. Love Famous Daves. Am a member of the PIG’s club and still have not received my birthday (7-14) coupon. I recently changed my e-mail address so that may be the reason. Love Famous Dave’s as it is the best bbq restaurant in the area. I’m a PIG member and didn’t even get an email for anything free on my birthday. I called there and they said they have never encountered this problem!